Uncategories What is up with me today? My shower curtain. 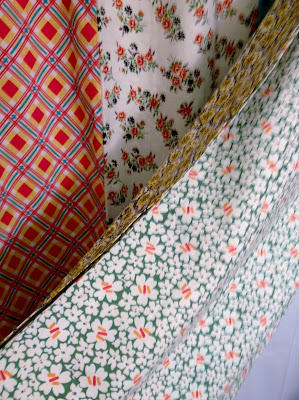 I've not been doing much in the sewing room lately. Blame a combination of laziness, family stuff, work, and me playing Tiny Tower on my iphone and my daughter's ipad. Now I've completely blown my cover. Oh well. Not that you care, but I did buy a new shower curtain. I hate shower curtains in principal so I'm very excited to find a shower curtain that expresses my fabric point of view. This is the photo from the catalog. The curtain was over my budget at Garnet Hill. So I went to the website like 50 times to look at it hoping I'd get over it and not have to buy it. Now I really did need a shower curtain. When we built our home I had little tiny kids and I wanted a tub on the main floor without a shower surround so it would be easy to bathe them there. 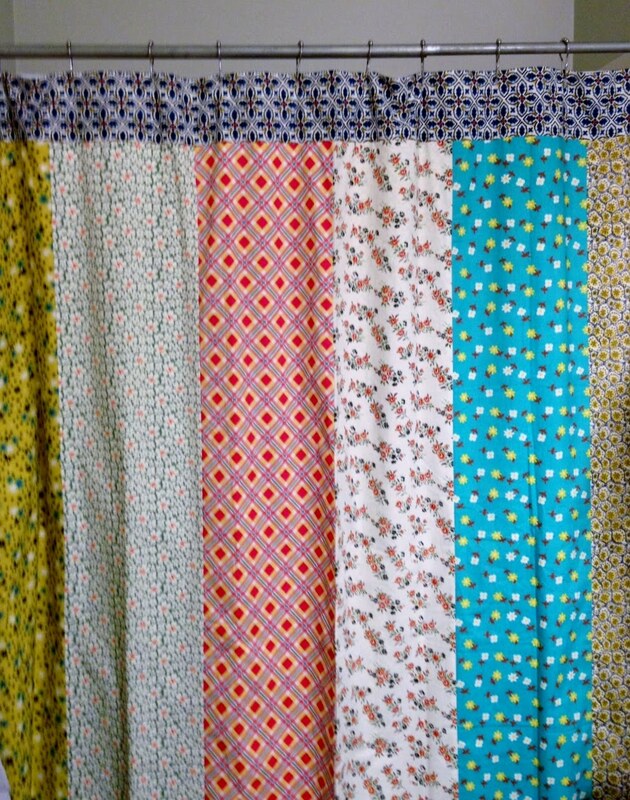 And the latest shower curtain I had there was 6-7 years old and looking very tired in a Rachel Ashworth type of way. So when Garnet Hill had a sale and I had an email coupon for an additional percentage off, I had to buy the shower curtain. I realize this is more than you probably care to know. So this is the shower curtain hanging in my main floor bath. Not as perky looking as the catalog photo but I am happy with it. However, when I took it out of the box, one of my daughters said, "Mom, it looks like throw up". Now that took the wind out of my sail. I like it but I have to admit it is a bit much. You might wonder why I didn't just make the curtain? Answer: I didn't want to. Ha. It is completely lined, which I also like. 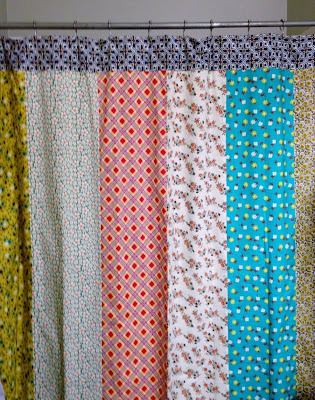 I think it adds weight to it and even though the curtain doesn't look as spiffy as the catalog photo, I'm glad I retired that dated Rachel Ashworth model and went with something colorful. It is a big change and adds color to the bathroom. The funny thing is, of course my husband didn't even notice. Ok, I am sewing a little. 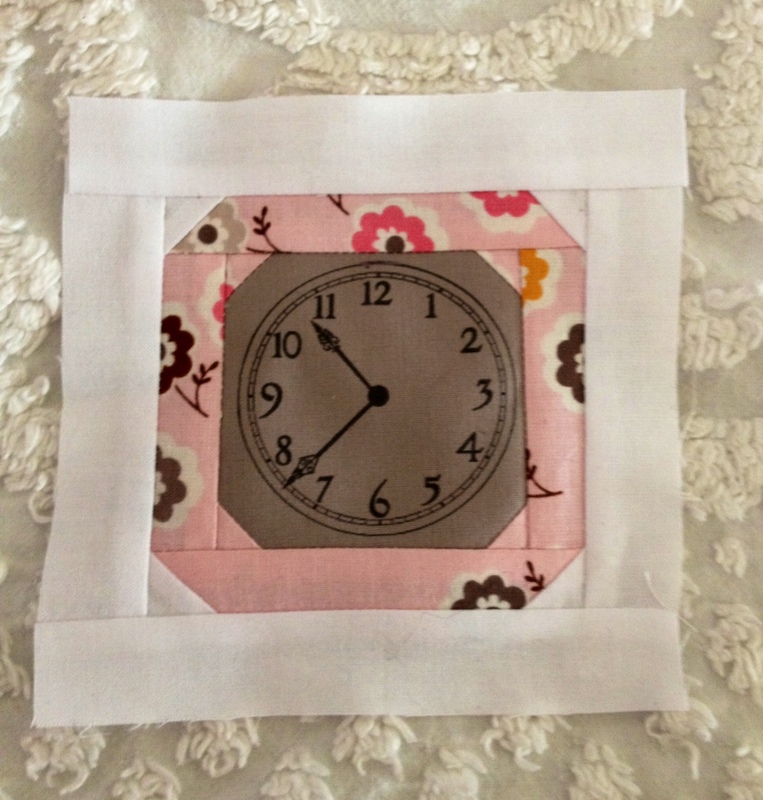 I am making clock blocks for my Daisy Cottage quilt. Because I am not a great stitcher, I went the lazy way and just printed off clock faces onto my fabric. 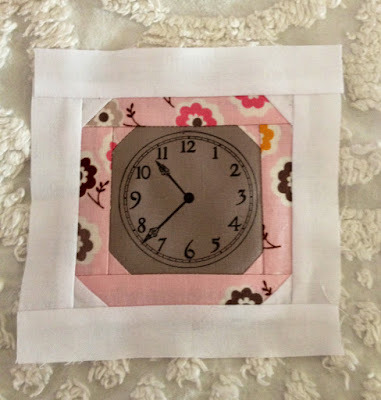 I've been contemplating several takes on putting clocks into a quilt and since Daisy Cottage has clocks in the fabric, I thought it would be kind of fun to add a little tiny clock to my collection of growing blocks. I have to tell you how incredibly uplifting it is to have had emails and comments about our sweet Eliza. I'm overwhelmed with the generous nature of people I don't know and will never meet and their kind words and helpful ideas and messages. Thank you all so much. Eliza had a set-back week last week but hopefully has turned a corner. She is back to bottle feeding and the nasal canula here is now off. I love this photo because you can see her eyes. She needs to take something like 100 cc via bottle before they want to send her home and right now she's only taking 1/3 of that. They use the tube to feed her the rest. She's awake more and is a very strong baby. We are all anxious to have her home so she can be held and cared for by her mother (and us). I am praying that she will be able to tolerate more milk by bottle this week. If you read all of this wordy post, you get a gold star. Usually I try not to bore you so much. What a fun shower curtain. Eliza is so cute! I hope she gets to come home soon. I know you're itching to hold her. Again, I shall never be disappointed if you end every blog post with an Eliza update. Love each and every one! 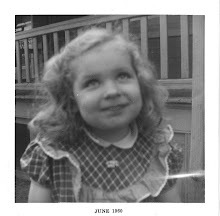 Have you and/or your family read Kelle Hampton's blog? 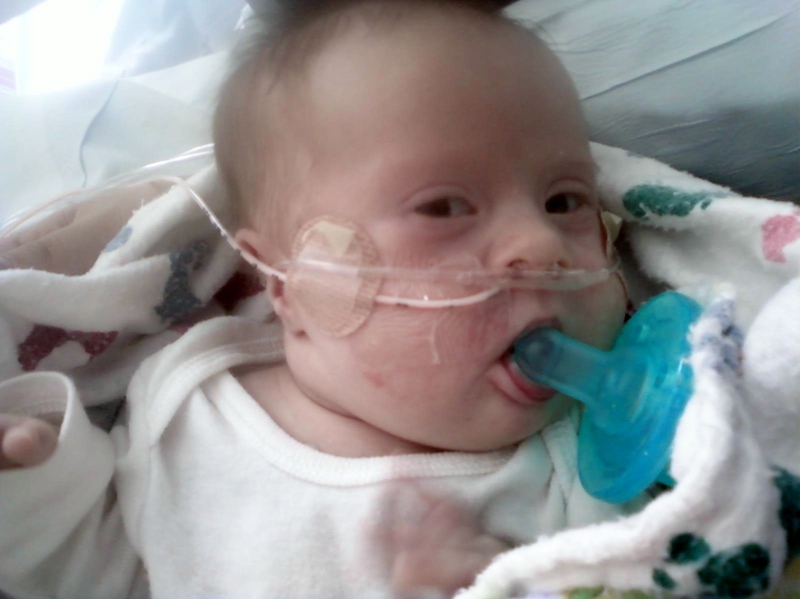 The starting point would have to be 2 years ago, when her daughter was born with Downs. Perhaps this blog will help give you guys hope and joy in this new blessing your family has been gifted with. Yay...a gold star for me! I really like the shower curtain but don't you hate how they put those starched to death pleats up there and in real life (especially in a shower with actual steam) that is not gonna happen? I made my shower curtain with some $2 a yard fabric at the LQS and I found 2 more prints from the line at another LQS for $5/yard so I made a valance topper. It is OK...not my first choice. I had to make the curtain because I needed a valance and extra long curtain to disguise the fact that I did not change the tub and shower tile when we did our big remodel in there last year. Glad Eliza is doing well and hope she bottle feeds more. I am wearing my gold star proudly. lol Eliza is such a little dolly! Soo cute! Continued prayers for speedy progress. :o) I kind of love the shower curtain. Not that I know you that well, but it's so "you". And I adore that little clock block!! My gpa collected and repaired old clocks, so clocks have a special place in my heart. I bought a similar shower curtain at World Market a couple years ago thinking I wanted to turn it into a hippie style summer skirt. :-) Still haven't done it tho. Eliza makes me smile. I know she is here for a reason. EVERYTHING happens for a reason. Much love to you and yours friend. More thoughts and prayers for Eliza - she is a cutie! I have a daughter who is brutally honest when she comments on my things. I think the shower curtain is great. Love your little clock blocks. 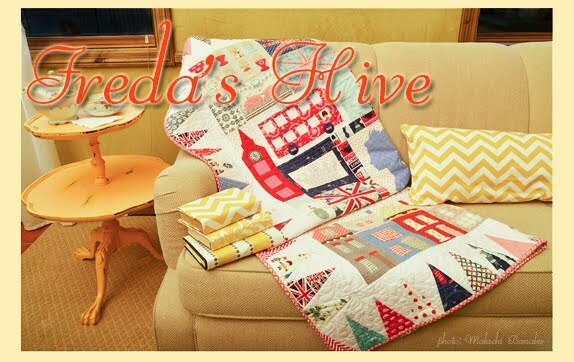 I have a "Cottage" quilt plan. Just need the time. Your sweet little Eliza is just the cutest. What a brave little doll she is! Continuing to pray for her health. Wow, you just printed that clock face on the fabric?? Amazing! Your shower curtain is soo cute!! Truly. And I don't blame you for not wanting to tackle something like that. Never a boring post from you, Nanette! I love the shower curtain, would have done the same thing and yes, my husband wouldn't have noticed either! Or maybe he would - he keeps wanting an all white curtain and I keep coming home with prints! Thanks for the pic of Eliza with her eyes open - always a delight at the beginning! Eliza's little lips are so beautiful, I'm sure her struggling has built more determination and strength in her. I adore your shower curtain, it is so charming, I've never seen anything like it amongst hundreds of shower curtains at the Bed, Bath and Beyond store in Miami. I made a little pink felt cover with a yellow bird sewn on for My little $15 Tracfone phone for seniors to hang around my neck. I like the big buttons and letters on the screen and it costs me $7/month for service. I can't believe how many people want me to make covers for their phones because they love the bright colors and the cute bird made of fabric. Eliza's coloring looks so good in the pic and I know she will be sucking down the rest of the required cc's before you know it! I like the shower curtain! Eliza looks like a strong girl...look at those wise eyes! Nice to know that she is growing. Pass the gold star! Read the whole thing! I found it very therapeutic. :) I've done the same thing, my husband has done the same thing and so has my daughter! We are living parallel lives. Not bored at all, my friend. I natter on quite a bit myself sometimes. I LIKE your shower curtain. It is bright, but that's a good thing. And Eliza is already looking more grown up. Believing with you she'll be home soon and having a wonderful time being spoiled. No boredom here. Beautiful Eliza - she looks like she's saying 'just you wait - I'll be home before you know it'. Love love the shower curtain. And your clock block. You hang in there now! Such a wonderful picture of your little Eliza. So fun to see her eyes open and figuring out this new world. And the shower curtain is so YOU! I bet it looks great in your downstairs bath. She is just so darn cute. Her cheeks have filled out now if she could only be more hungry. I like your shower curtain. Your post is not boring. 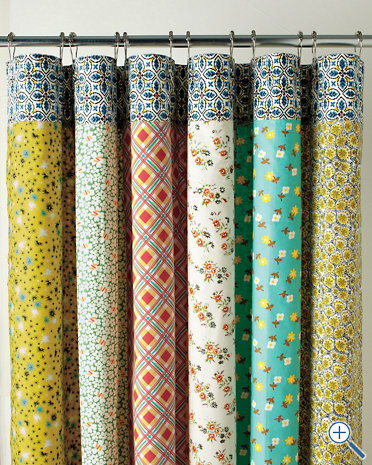 I enjoyed seeing your new shower curtain which reminded me that I bought fabric to make a shower curtain so maybe I should do it. I think the clock block is so cute! And I was glad to read the Eliza is doing better. Keep us updated. And thanks for the gold star. LOL! I like wordy :) It's so nice to work a deal and get something you like from a shop--and this is very colorful and seems very "you". Eliza looks pleasingly plumped up and I hope she continues to gain weight and feed well so that she can come home finally. Hoping Eliza continues to improve. Our thoughts are with you and the rest of her family. Thanks for the offer of the gold star, but getting to see a new photo of Eliza is definitely a reward for reading until the end. She looks so alert. I'm sure once she is home, grandma's hugs will make up for all of the nasty things she's had to go through. Oh dearest, you are NEVER boring! LOVE that shower curtain -- what a fun bright spot for the bathroom. I also love that cute little clock block -- very clever. And you know what Eliza is saying -- "I'm lookin' at YOU!" Eliza's hair looks so soft and sweet. Glad to know she continues to grow stronger. I can only imagine how hard it is on her mom and dad to not be able to have her home yet. Prayers and blessings to you all. Loved your post...never too long! So happy baby is doing well and hope that she can go home soon. My oldest daughter was pre-mature and had pneumonia so had to stay in the hospital 10 days...it was so very difficult as we had a 2 1/2 year old also...so I really feel for what your family is going through. It will be so nice when baby can go home! PS LOVE the shower curtain! What a genius idea to print off the clock face. You always amaze me and I love the block. God blessed little Eliza with so much Love from everyone. And those eyes! So expressive.Such a sweet looking little girl. Eliza is a cutie. Hoping your wish comes true and you have her home soon. How lucky she was to be born into your family where she will be showered in love. Love your new shower curtain. I'm so happy to see an update on Baby Eliza. She's adorable and will be home very, very soon. I heard this once before, and I am sure that you have also heard it. However, in case you have not, I have to share this quote - "It takes a special person to raise a special needs child." A friend of mine who has a daughter with extreme special needs found a lot of comfort by telling herself for the first few months. Eliza is so lucky to have such a loving family with all of the support that she has. Hope she comes home sooon! Awwwww! Eliza is SO cute. I hope she gets to come home soon! My son Mason was in the NICU when he was born 7 weeks early. Gosh those nurses treat the babies like they're their own. The shower curtain is so YOU. Love it! I can top the age of your old one, I bought mine at Target over 10 years ago. LOL! But I still love it, it's a Waverly print of red roses on tan. Anyway yours is getting me thinking! Blessings to you and your family....especially that recent addition, and those that care for her! Great to see an Eliza update! Hopefully, it won't be long now and she'll be home very soon.